Published: Dec. 9, 2018 at 10:22 p.m. 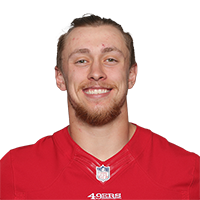 Published: Nov. 1, 2018 at 10:08 p.m.
San Francisco 49ers tight end George Kittle completes epic drive with touchdown catch. Published: Sept. 30, 2018 at 08:08 p.m.
San Francisco 49ers quarterback C.J. Beathard finds tight end George Kittle in the middle of the field who goes 82 yards for a touchdown.